The San Antonio River falls approximately nine feet from Brackenridge Park and the Pearl Brewery to downtown. 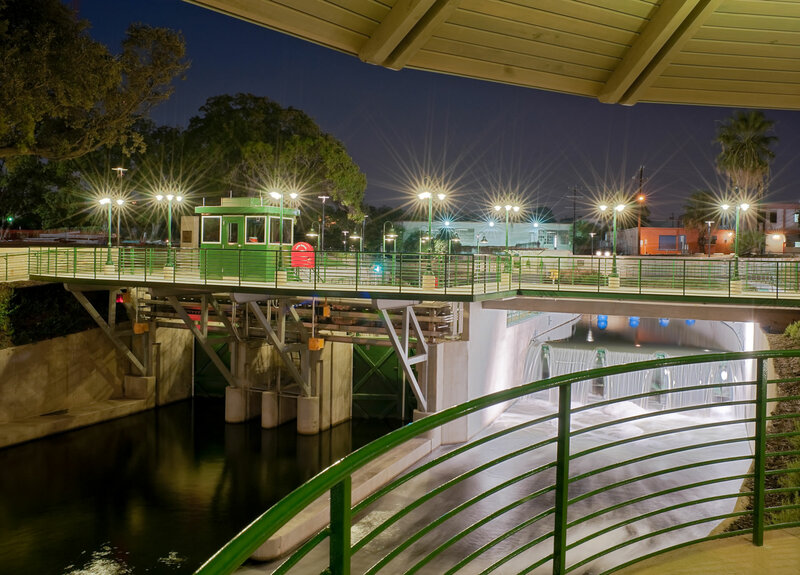 In order to allow boat travel from Downtown up to the Pearl, engineers devised a lock and dam system into the River Improvements Project. Via the AT&T Lock & Dam, river barges are raised and lowered to allow for unimpeded traffic up and down the river. While now a mainstay of the Museum Reach of the river, the lock & dams future was not always a certainty. Stories are whispered of the lock & dam at one time being eliminated from the project due to cost concerns. “Why we can just have stairs for people to climb and another fleets of barges.” it was said. “Just think of the cost savings!” In the spirit of the strong and determined women of the San Antonio Conservation Society who prevailed upon city leaders (insert “men”) to not channel and pave over the river after the floods of the 1920’s, former mayor and co-chair of the San Antonio River Oversight Committee, Lila Cockerel summoned both the mayor and county judge to a meeting. There she sat them both down and said, in no uncertain terms, “Boys, you will not take my lock & dam out of this project!” Through her efforts and a generous donation from AT&T, the rest, as they say, is history. Here’s to strong women and the San Antonio River.